L’Artusi was badly in need of an updated review. Not because anything has changed, but because we’ve eaten here about 1000 times since we first wrote about it in 2009. This restaurant is still one of our all time favorites in this town. A few things stand out as qualifications for such an honor: outstanding and consistent food, great service, an excellent wine list, and some ancillary entertainment since we can’t sit still. Let’s address each individually. 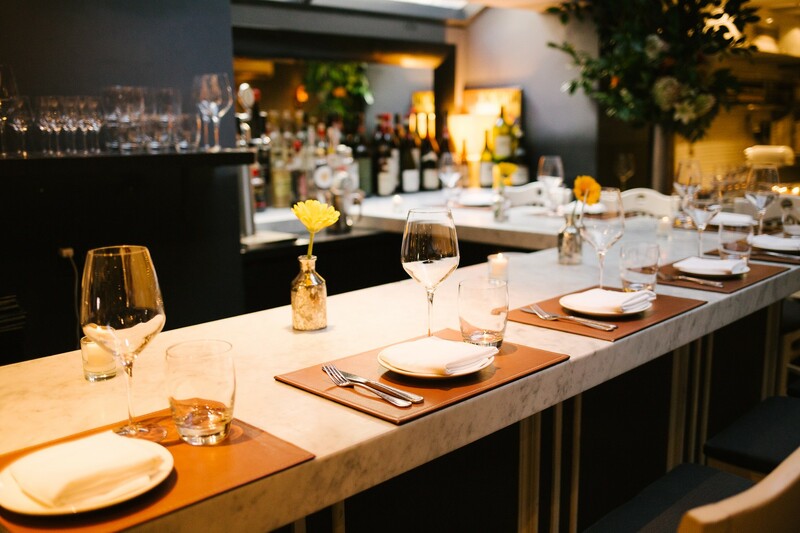 L’Artusi is the sister restaurant to Dell’anima, and it’s the larger, louder sister for sure. The cuisine is Italian, and it’s the kind of Italian cooking that’s not afraid to go heavy on big flavors like garlic, lemon, olives, chiles, and fat to win your favor. Not that it’s unrefined - these are some of the most well thought out and beautiful plates we’ve had the pleasure of eating at an indecent pace. The service is fantastic, from the hosts to the bartenders to the guy getting crazy at the cheese counter. And the wine list here is unparalleled. There’s a huge, expertly curated selection of Italian bottles from every part of the country, categorized by region and accompanied by information on what to expect from each. You can find everything from an excellent Rosso Di Montalcino for $45, to a $650 Gaja Barbaresco that will make you wish you had $650 to spend on wine every night (don’t do that). Stick to the affordable stuff and ask for help. The sommelier will happily lead you to great wine at good value. As for entertainment, that comes in the form of excellent people watching. There is always a good mix in the room of dates in various stages of progression, generally hot people, and a celebrity here and there to pretend you don’t notice. Not to mention one night when some dude spent three minutes violently pounding on the bathroom door that he couldn’t push his way out of, despite the massive “pull please” directly in front of his face. Maybe go easy on the Barolo, dude. The most important thing about L’Artusi, though, is how you do it. Here are a few things to know: it’s critical that you sit at the bar if you are a party of two. The tables in this place get cramped unless you’re at a big one, and it’s also the easiest way to get a seat - reservations can be hard to come by. It’s also important that you follow our Food Rundown, almost exactly. Everything at L’Artusi is really good, but if you do things our way... it’s great. Every meal at L’Artusi should start with an order of their housemade ricotta, which is sort of like a glorious hybrid of cheese and whipped cream. It will be paired with some sort of seasonal jam on the side and served to you with homemade butter crackers. Ask for extra crackers. You’re going to want them. Easily one of the best things we have ever had at a restaurant, and we will not back down from that statement. This is a plate of roasted mushrooms and pancetta topped with a fried egg and ricotta. The mushrooms are salty, rich, and loaded with lemon. Add a fried egg and ricotta salata, and suddenly the fork seems worthless. Next time we come back, we are ordering three of these and bringing one of those little shovels that kids make sand castles with. You want to eat pasta at L’Artusi. Don’t even worry too much about the entrees. If there are two of you, order two pastas and share them. Maybe even do that if there’s one of you. This orecchiette is one of the staples on the L’Artusi pasta menu, with lamb sausage and swiss chard making for a nice change from the traditional sausage and broccoli rabe. Another legendary pasta dish from this menu. This is served with a mushroom ragu that’s so hearty it might as well be meat. So good. Straightforward and simple, with some tomato, pancetta, and pecorino. You can’t go wrong with this on your table. There’s always a special, and it usually includes squid ink and some sort of crab. You should get it. Also, any pasta with breadcrumbs on top should be eaten. A seasonal menu item that you absolutely need to order if available. This is like a mix between risotto and barley salad, and it’s incredible. Don’t screw this up. Finish your meal with L’Artusi’s olive oil cake at all costs. It’s the best one we’ve ever had, by far. We like to kick things off with a glass or two of the Lini White Lambrusco, which is amazing. As for wine, we’re big fans of anything from Tuscany or Emilia Romagna. You also can’t go wrong with a bottle of Nebbiolo to drink with your pastas, and you can often find an excellent one on this list for around $65. Fiaschetteria Pistoia is a tiny Italian spot in the West Village that’s great for last-second dates.